The range comprises the finest Dimensional Measurement Calibration, Force Hardness Calibration and Electrotechnical Calibration, having a high preference in the market. The services made available as per the set industry norms and guidelines, has their quality highly standardized. Further, the offered range is priced reasonably, for reasons of providing maximum client satisfaction. 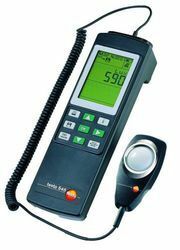 Being one of the leading providers of this Lux and Sound Meter Calibration Services, we never compromise with its standard of quality. Thus we engage in the using of high grade resources, in compliance with the set industry norms and guidelines, for providing it. In addition to this, it is made available by highly skilled professionals, for reasons of quality maintenance. Looking for Lux and Sound Meter Calibration Services ?